Whose website still says "Dragonmeet 2009 will open its doors on Saturday the 28th of November 2009 at 10am." Conpulsion, Scotland's premier gaming convention, will be held March 25th-27th, 2011! Don't miss this exciting con. We'll have tons of RPG games, ranging from D&D to homebrew, plus war-game tournaments, LARPs, card game tournaments, and board games. New this year will be computer games from Scottish Game Jam and a LARP ceilidh on Saturday night. We have a load of great guests coming as well! Also, don't forget about our amazing charity auction plus a raffle (to be held during the ceilidh). To enjoy all this it is only £10 for the day or £15 for the whole weekend! Pre registration is open and more information is available at www.conpulsion.org! They decided that the document should be unreadable. If it is unreadable, it is not constitutional. And if it has "Dropship wholesale" in it's sig it is a spambot. I just wanted to let you know that on Saturday 8th October London Indie RPG will be one year old. For me it feels an important thing to celebrate as I thought that the group might not be quite the success it has been. This has been due to many newcomers and old lags coming to the meets with a sense of curiosity, enthusiasm and the desire to be involved in great RPGing. We now have over 100 members and this continues to grow at an encouraging rate. It would be great to see new and familar faces on our birthday. We are having our usual sessions of gaming but with added cake as it seemed to go down very well last time we did such an event. We may even give out the odd panda dice (if Graham is around). PS - yes, I appreciate this clashes with Furnace, apologies for this. 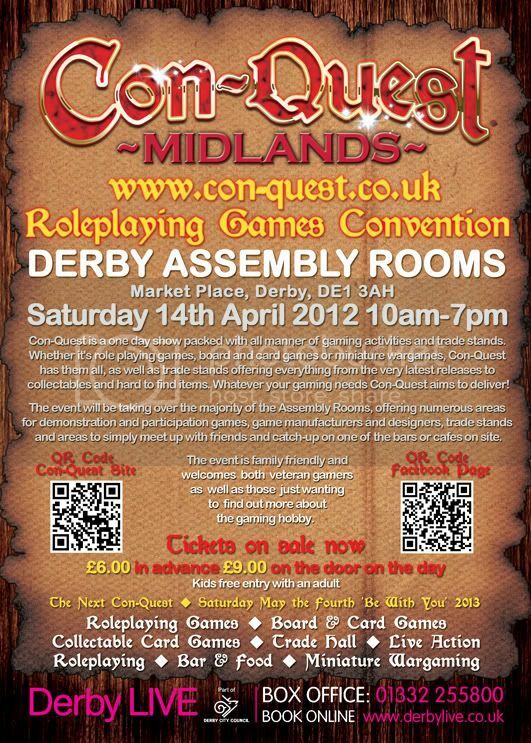 Here are the new flyers for Con-Quest 2012. 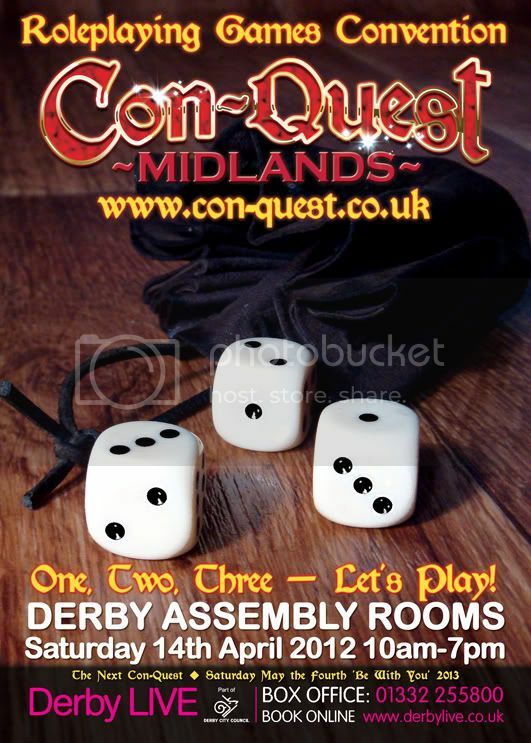 The three dice signify the third event of Con-Quest, as it’s our third year! yes, its that Dragonmeet time of the year again. No, I know its not very useful. No, the chances are it wont be updated much. Lots of RPG merriment for all the family in a friendly environment! Traders, loads of games, demos, a bring'n'buy. Congenial is the latest in the series of British Roleplaying Society RPG conventions, the successor to Consternation II. It will be held at Murray Edwards College (formerly New Hall), Cambridge, England, over 10-12 August 2012. Our Guests of Honour are the awesome Phil and Kaja Foglio, best known for the triple Hugo-winning webcomic Girl Genius. We are also the 24th in the Unicon series of SF/Fantasy conventions, and will be having programming by The Write Fantastic writers group. Membership is £30, from Congenial, 19 Uphall Road, Cambridge, CB1 3HX. Rooms in the college are £63.75/night en-suite, or £43.75 with shared facilities. There is a £5 discount for the weekend for rooms booked and paid for before 10th January 2012.